You are invited to another spectacular night of enlightening entertainment or what we call "enlighter-tainment" at Conscious Club on Saturday 22nd October, Paddington Town Hall. Quantum field physics has proven that at the subtlest level of existence that EVERYTHING is VIBRATING. If it's vibrating, then it is making sound. The question is, what kind of sound ? A pleasant one, in tune with its surrounding and contributing in a positive way, or an out of tune one, disturbing the atmosphere. Believe it or not us humans are vibrating and in the midst of our busy, technological world it's easy to get out of tune. Sound has been used for healing in cultures around the globe for millennia, but only recently, thanks to new scientific advances, have we begun to understand the profound benefit sound can elicit on our physical wellbeing and the elevating effect it has on our conscious state. 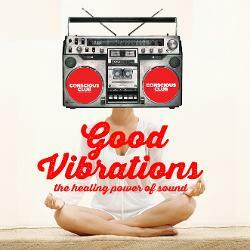 Conscious people, it's time to learn more about the power of sound and get tuned-up at Conscious Club GOOD VIBRATIONS! It is with great pleasure that we invite Matt Omo, back to Conscious Club after the huge success of our previous sold out and much talked about sound healing. Matt will provide deep insights into the effect of sound on the body, mind and spirit and lead us through a transformational sound immersion using a swag of instruments supported by Emanuel Lieberfreund, and innovative techniques to create a powerful 60 minute sound bath! PureHeart Alchemy will be mysting their high vibrational scents to heighten your experience. You'll be lying down and bathing in the sound with over 400 other sound-ma-naughts being taken on an audible journey! Experience the rare power of a sound healing on mass only at Conscious Club. Also, our international guests from Damanhur Sustainable Community in Northern Italy will explain their research of capturing the electromagnetic variations of plant leaves and roots. They will demonstrate how plants can sing! Bring your favourite pot plant along to see it to believe it. Singer/Songwriter Nadav will rock out his very powerful and moving indie rock vedic chants. This will be a profound experience for everyone in the room, experience the energy and learn how these sounds affect our internal vibration and wellbeing. To top it off there will be the much enjoyed Conscious Club "Mix and Mingle", so hang around and connect with new conscious friends, laugh and share your experiences and feed your soul with like minded conscious folk while sampling tasty treats from Star Anise Wholefoods, and sipping on Ayurvedic teas from Moksha Ayurveda while think up a great idea how you can use Conscious Currency... the new giving economy. Space is limited don't miss out on all the Good Vibrations - book now! Bring your favourite pot plant to hear it sing and don't forget a yoga mat, blanket or towel -you'll be lying flat on your back!! Conscious Club is Not-For-Profit Organisation and a community service, in order to keep our ticket prices as low as possible for everyone in our community to enjoy, we are offering you the option of selecting a healthy vegetarian, gluten free meal, in addition when purchasing your ticket. For catering purposes all meals must be ordered by Monday 17th October.